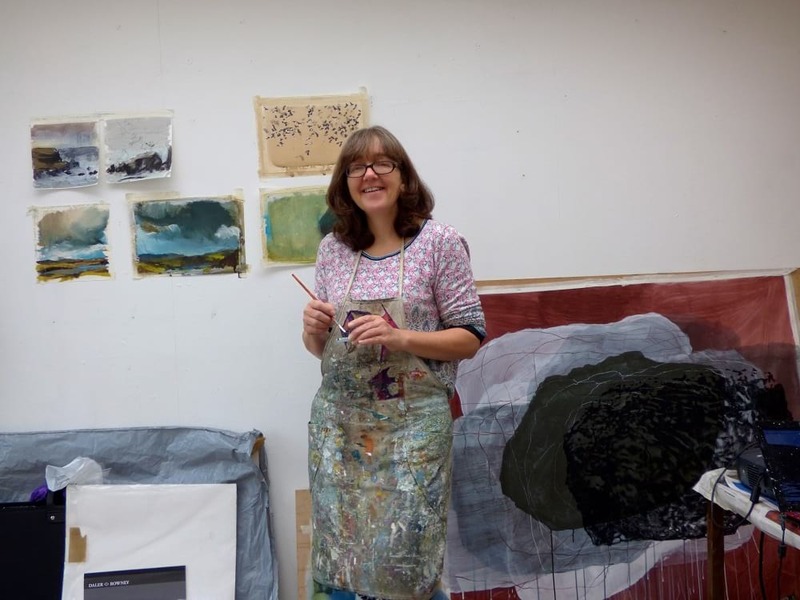 The Somerset-based artist Sara Dudman RWA is known for her dynamic, multi-layered works inspired by landscape and nature. She likes to completely immerse herself in an place, and her paintings and drawings often emerge from studying her own video footage of an environment. 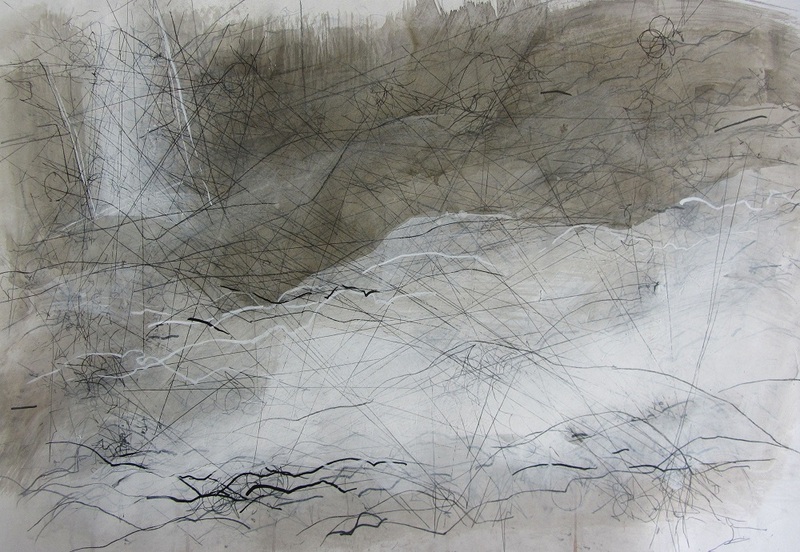 This allows her to explore ideas of permanence and impernanence, and to express something of the living, moving nature of a landscape on canvas or paper. Sara was elected as an Academician in 2016 and has frequently exhibited works at the RWA, including the recent Togetherness exhibition in collaboration with fellow Academician Debbie Locke. Ah… a very good question which could have many answers…..
Like many young girls, I adored all animals and my passion was horse-riding during my childhood and teenage years. I was very keen to become a vet. One quiet Sunday when I was 11 years old, I took the colour Sunday supplement magazine, containing a photographic section focussing on African wildlife up to my room and spent the afternoon making a detailed pencil drawing of an elephant and her calf. I became totally absorbed and mesmerised by the process, losing myself entirely – this was a new experience for me and when it was clear that I had some natural talent, from that moment on things began to change. I love how my interest in the natural world constantly infuses my art. Because it helps me understand and make sense of the environment I inhabit and the relationships between the different aspects. I feel immense joy from being able to develop my own visual language to interpret and present these experiences and analyses to others. 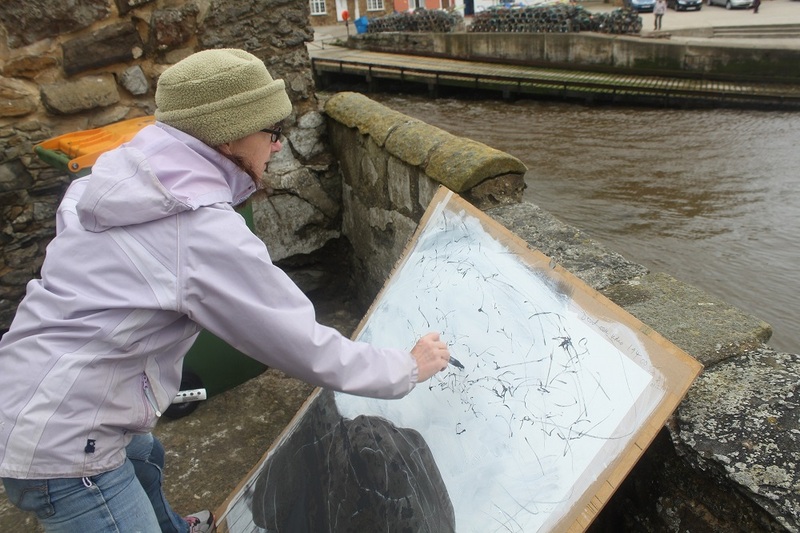 I regularly undertake residencies which begin with a period of immersion in the environment: long walks, drawing, videoing, note-taking and documenting experiences, sensations and observations and, where possible, talking to specialists and locals. I document my walks and encounters using film (circumnavigating rocks or other landscape features with hand-held video recorders and petcams, clipped onto clothing and backpacks, or running film footage of flocks or swarms of wildlife activity) and return to the studio to watch, analyse and reinterpret the video footage using drawing and painting techniques. I work with both drawing and painting processes. Interestingly, the potential for change is immense when creating a painting compared to a drawing which is a more methodical and measured process. In both cases though, I begin with watching and re-watching sections of video footage to identify patterns of movement and forms. This has the potential to be developed into a reinterpretation of the experience – however, it is only through embarking on the process of laying down marks, gestures and colours that the true nature of the work begins to reveal itself. It quickly moves into a stage which I describe as ‘getting into dialogue with the painting or drawing’, responding as much to the work itself as the original video source. Much of your work responds to landscape, nature and geology. How important is place to your work? My immersive residencies are usually to remote, wild or coastal locations (Shetland, Abruzzo, Italy, Cape Cornwall, North York Moors, etc.) allowing the place to direct my responses. Whilst the locations are thoughtfully researched for their specific potential (in terms of geology, wildlife, climate, history, environment), I welcome planned and chance encounters which inform and influence the resulting responses and works. My artworks are products of deep immersion in these remote environments and increasingly speak about the universality of experience in remote locations rather than the specifics of individual places. 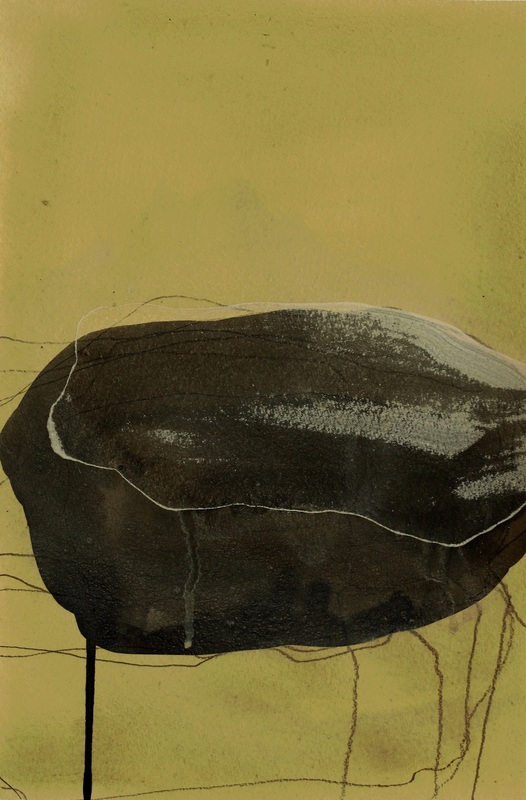 I represent rocks as metaphors for defining and questioning assumptions about permanence, resistance and protection. The physicality of navigating rocky coastal terrains, which is central to my practice, brings me close to the smoothness of eroded surfaces juxtaposed against newly fallen rocks, or those hurled up by the fury of the seas. Combining representations of geological and environmental aspects of experience with flocks and swarms endeavours to communicate ideas of universal relationships with the land. My work is constantly evolving. I firmly believe that the moment I think ‘I’ve arrived’ at a destination or end point, I should stop painting, as for me, painting is a continual quest and exploration. Each artwork is born directly from the preceding work, extending, challenging or developing themes and concepts which arise through the act of making. Spending time working in collaboration with fellow RWA, Debbie Locke, on our project, Flock Together’ was enormously developmental for us both. You were made an Academician of the RWA in January 2016. What did that mean to you? Being elected as an academician by my peers was an outstanding tribute to my practice and a strong endorsement of my work and recognition of its impact and potential. One of my main aims in exhibiting my work is to discover the extent to which my paintings and drawings communicate to a wider audience, so becoming an academician was a strong testament to the communicative potential of my work. I feel honoured and privileged to be part of a very dedicated and proactive artist community, committed to the exhibition, sharing, understanding, development and education of art. I have thoroughly enjoyed getting involved in many ways, including being one of the judges for the 165th Annual Open exhibition in 2017, along with becoming part of the Open Exhibition placement team and also selecting the ‘Artwork of the Month’ for December 2017 – January 2018 amongst many more things (including giving a talk for the RWA Friends with Debbie Locke in April 2018). You have shown works in the 2018 RWA exhibition Togetherness, created jointly with Debbie Locke RWA. How did you find working in collaboration? To work directly over one another’s marks and surfaces requires not only trust and courage but also a rigorously agreed set of rules, parameters and expectations. We entered the collaboration as two very different artists, with a shared interest in innovating to develop ways to reinterpret and represent movements, relationships and connections with the landscape. Debbie’s starting point was as a wholly conceptual artist and mine was as a more traditional painter/drawer working at the boundary between figuration and abstraction. Our different approaches, perspectives and needs which we each brought to the work enriched and challenged us in equal measure, inevitably leading to us both critically interrogating our individual and joint practice in exciting ways. I am working on an evolving series of large-scale works on paper exploring ideas of permanence and impermanence using rocks, clouds and swarms as motifs. Alongside these large works, I am also working on a series of water-based works painted over air letters sent and received in the 1950s. The letters were given to me by a friend when she was clearing out her father’s possessions and invited me to use them as a base for making works. The ideas of correspondence, permanence and impermanence contained within the letters echo the ongoing explorations I am making. 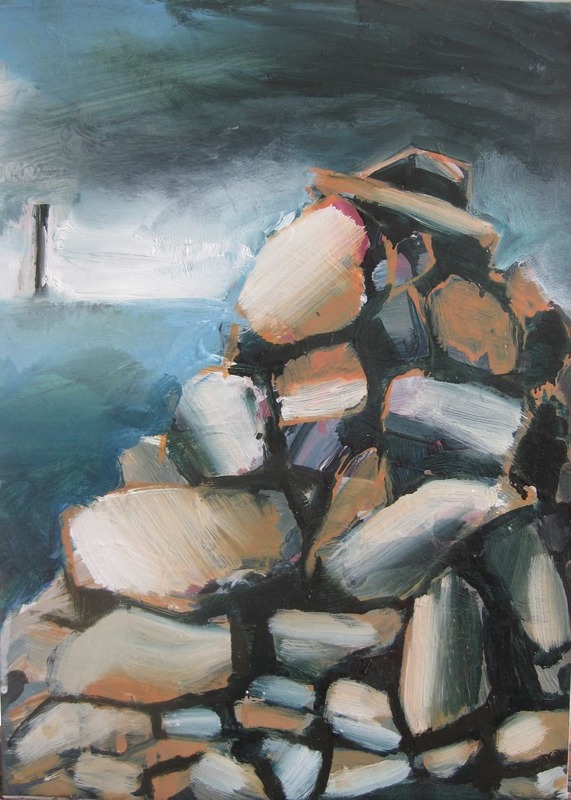 Whilst derived from experience, my works do not rely for their worth on accurate depiction of specific rocks, clouds or places and speak as much about the physicality of painting as of their subjects. And finally – a fairy godmother waves her magic wand and says you can own any artwork in the world. What do you choose? I think it would have to be Picasso’s ‘Guernica’. I have admired Picasso throughout my life as an absolute genius of an artist. His capacity to speak about the human condition and experience and our place on the planet is unrivalled in my opinion. ‘Guernica’ is a complete tour de force! Sara Dudman’s website is at www.saradudman.com. 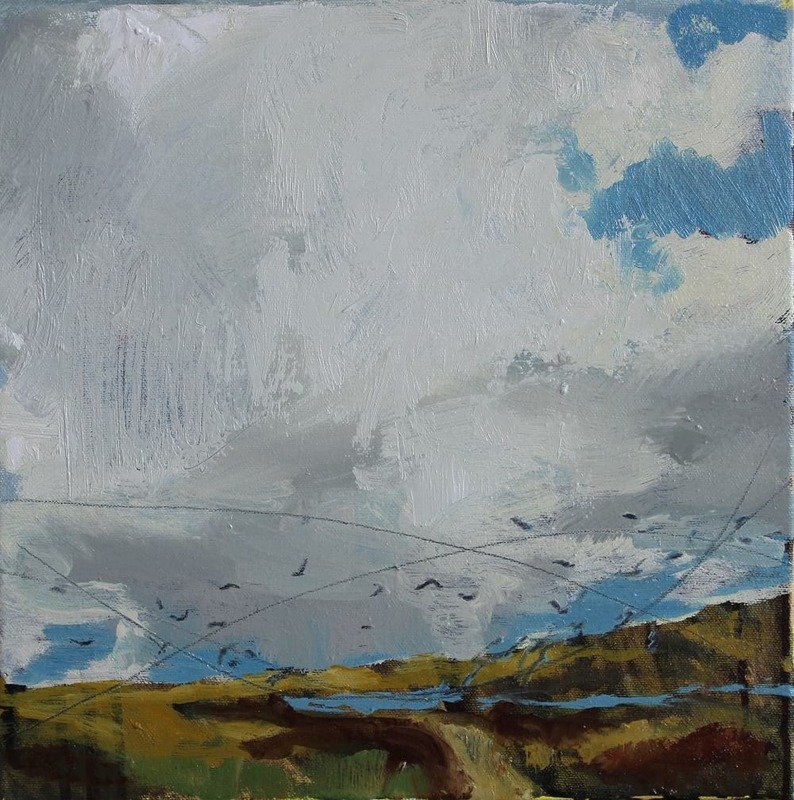 Sara is currently exhibiting in a ‘Turbulence’, a 2 person exhibition with Jenny Graham (RWA Artist Network Member) at Staithes Studios Gallery, Staithes, Yorkshire. More details here. She has also had work selected for the 2018 BEEP Biennial Painting Exhibition (exhibiting in Swansea). Sara is represented by One Church Street Gallery who will be showing her works at both the New York Affordable Art Fair (26-30th September 2018) and Hamburg Affordable Art Fair (15-18 November 2018). She also has works on display at Porthminster Gallery, St Ives.